Fermanagh manager Rory Gallagher was a happy man at the final whistle in Brewster Park on Saturday night. The air was cool and crisp but Gallagher had been warmed by the performance of his team who beat Kildare by two points but should have won by more. 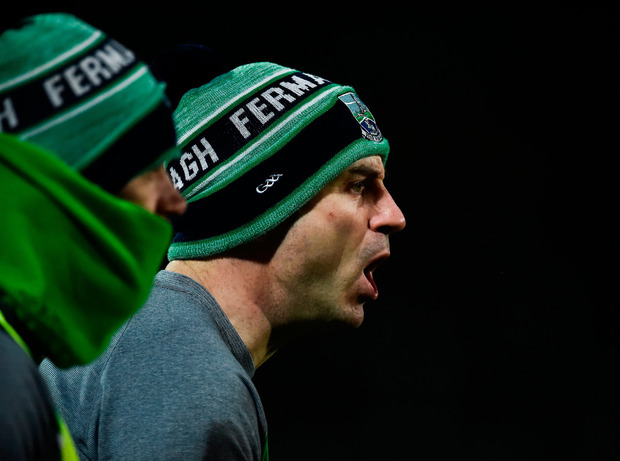 Fermanagh converted only eight times from 22 shots but it was enough to see off Kildare who were incredibly laboured in attack and managed only 11 shots in 70-plus minutes against a packed home defence. "Delighted with that. I thought that was our best performance but to be honest I thought we have been the better team in our last two and a half games. "We made life difficult for ourselves and we missed a hell of a lot of chances. We opened them up for a few goal chances too but for heart and guts and willingness to put the body on the line and desire to play for each other you would be very happy," said Gallagher. The Erne boss was right. Fermanagh counter-attacked with great speed but it was their shooting that was to keep Kildare in the game with the home side wasteful in front of the posts. They led by just two points at the break despite dominating proceedings in the first-half. Seán Quigley with frees and Conall and Ryan Jones and Eoin Donnelly were on target for Fermanagh while at the other end Adam Tyrrell with frees and Fergal Conway were on target for the visitors. Kildare were poor throughout and in the second-half didn't manage a single score from play. Entered the final 15 minutes the sides were level. Ryan Lyons stepped up to be the hero with the last two points, both taken with a calmness and assuredness that the Fermanagh attack is not always renowned for.